Astakos was very famous for its oak tree forest. The whole town used to earn a living by collecting the oak tree nuts and selling it to produce colours for dying leather and cloth. Last week we had a special visitor at school. A grandmother came to school, talked to us about these past times and showed us the traditional way of spinning wool. We then put oak nuts into boiling water and observed it taking a nice brown colour. We dyed our wool in it, let it dry and used it for weaving. On the 5th of June our school celebrated the World Environment Day. We all decided to take care of our beaches in Astakos. The students spent a whole morning collecting rubbish from the seashore. We were all very happy about our effort and very proud of our beautiful, clean coast!!! ...in Elba schools: our friends from Jelgava school are on a european school trip: 5000km by coach to keep in touch with Europe, despite not having obtained the partnership fundings. They came to Elba, 6 teachers and 39 students with a special gift: the "Bez Temata" music, songs and dance show. Our pupils felt in love with latvian dances and they soon learnt them. The end of the year show in Porto Azzurro grade 3 this year is about healthy nutrition. Our friende Ase Kristine and Linda saw the performance: songs, poems and scenes written by the students during the schoolyear and performed with a live orchestra of children from different grades. Tonight a special dinner to celebrate the end of the school year, the end of a wonderful partnership but, more important, friendships that don't finish with the end of partnerships. In Porto Azzurro there are two teachers from Gjerstad school, Linda and Ase Kristine, working in our classes and having a look at our celebrations of the end of the school years. And there are our friends from Latvia, Aiga and Vita with four more teachers and 39 students on a school trip. 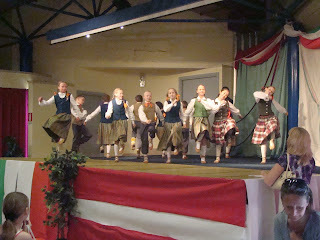 They'll show us "Bez Temata": music and dances performed by the pupils. Two big gifts from our friends for our pupils. Let's hope this is a "good look" for our new project.... finger-crossed!!!! ...or happy to start a new adventure??? And some of the future (we hope) Comenius ambassadors!!!! What can we (people from Elba) say about the meeting in Astakos? Only a huge, enormous THANKS!!!!!!!!!!!!!!!!!!!!!!!!!!!! We had a great time in Astakos, every second was perfect and exciting for teachers and pupils. We were very sad to say farwell to our friends from Elba. We had a fantastic time learning a lot from each other. Hope you had a fantastic time with us. We had lots of fun making bruschetta with you during our Italian Day. Our Comenius Group consists of five schools; one in Wales, two in Italy, one in Norway and one in Greece. We work together on an environmental project, we cultivate our school vegetable gardens and we travel twice a year to meet each other. 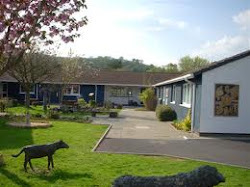 Our school is a community school with seven classes from Nursery to Year 6. We are a happy school with a capacity for 144 children. Our school is in Porto Azzuro, a village founded by the Spanish on the wonderful sea!! 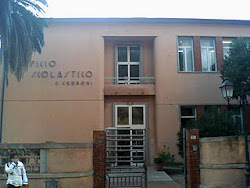 Our school's name is "Giuseppe Cerboni" in Marconi Street and it is in the heart of the village. It's very big, and a bit old, it's pink and it's got big windows so we have bright classrooms. There are very nice flowerbeds in the small garden with palm and holm trees. There's also a small but beautiful vegetable garden where we grow some kinds of vegetables. At ground floor there are the Secondary School, the staff offices and the head teacher's office. If you climb up the stairs you arrive at the first floor: There are primary school's classrooms. Some are small and some are very big. All of them are nice, bright and comfortable. There is also a school library with lots of books and a L.I.M. There's a gym with circles, balls, a basket and ninepins. In the gym the noise rumbles! I don't like it... If we shout the noise is terrible. My favourite place is the vegetable garden and the library. I would like a lab too. I hope you like our school. Our school is a large state school located in a rural area not far away from Florence.We have about 1650 students aged between 3 and 13. 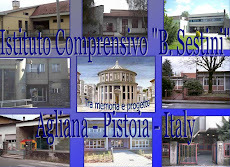 It consists of 8 separate buildings corresponding to 3 school grades: nursery, primary and lower secondary school.Each school has its own features corresponding to the age and the needs of students but they also have common characteristics such as a computer lab, a library and... of course a vegetable garden where we can grow flowers, plants, fruit and vegetables!! Our school is housed in two different buildings, one in the centre of Astakos near St. Nikolaos Square and one in the area Chovolio near the peripheral road. Both schools were built in the 1960's. Our school is a public school. There are 170 students from grade 1 to grade 6.We have a drama club, a cinema club and a library. We've just started making our school vegetable garden. Who was the Comenius Programme named after? John Amos Comenius (28 March 1592 - 4 November 1670) was a Czech teacher, educator and writer. He served as the last bishop of Unity of the Brethren and became a religious refugee and one of the earliest champions of universal education, a concept eventually set forth in his book Didactica Magna. He is considered the father of modern education. He lived and worked in many different countries in Europe, including Sweden, the Polish-Lithuanian Commonwealth, Transylvania, the Holy Roman Empire, England, the Netherlands and Royal Hungary.